The Rohr McHenry Distilling Company was a major Benton and Columbia County employer during its heyday, operating for a full century from 1812 to 1912. The McHenry Distillery was located about a mile and a half west of Benton and was built by John McHenry in 1812. The founder was known locally as "Hunter John" and was born September 13, 1785 in Fishing Creek Valley. Hunter John married Helena Cutter and they produced nine children. The youngest of these was a son, Rohr, born in Benton Township in 1829. When his father died, Rohr McHenry took over the "Still House," as the McHenry homestead was known locally. 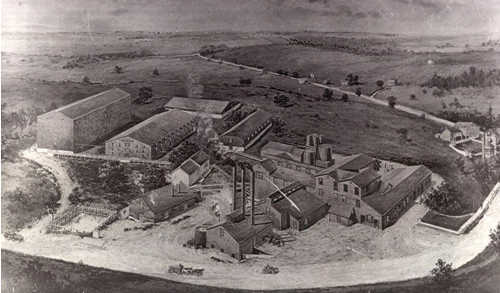 Rohr was responsible for expanding the distillery into a serious commercial operation, the Rohr McHenry Distilling Co. The whiskey he produced became known locally as "Old Rohr". An ad in the local paper proclaimed that the company's "strictly pure rye whiskey was double distilled in a copper lined doubler, from thoroughly cleaned rye and pure spring water." The distillery produced 100 gallons a day. Rohr and his wife Caroline had five children: George, Henrietta, Louisa, Charles, and John Geiser McHenry, the latter born in Benton on April 26, 1868. John G. was educated in Benton and after graduating from the Orangeville Academy he launched into a career as a farmer, manufacturer, banker, distiller and politician. It was John G. that stressed the date that the distillery had been established, using the familiar slogan "Born 1812." His interest in politics earned him three terms in Congress (D), beginning in 1906 and ending with his death in 1912.
Business boomed under John G.'s care, as did the local farming economy which was supplying the stills with rye for production of whiskey. The company advertised that "This whiskey is the product of selected Rye and Malt pure mountain spring water and scientific distilling with years of perfect aging in charred barrels in heated warehouses and coming direct from us it brings to you the finest & purest Whiskey made, and costs you no more than the other brands". John G. also established a peach orchard containing 30,000 peach trees on what he named "Pioneer Farms" with the intent of adding peach brandy to the McHenry production line. Peach trees take up to 15 years to reaching maturity, so the operation was part of the long-term vision for the business. The orchard and other farm crops, including rye, and a vineyard was cared for by Prof. M. E. Chubbuck from State College with the help of 40 or so employees. The farm also included a building for large-scale production of poultry. Disaster struck the company in March 1911 when fire destroyed the 10-storey bond house. It housed 17,000 barrels of maturing whiskey: only one was saved. Although much of the distillery plant itself was saved from the fire and production was later resumed, the financial blow caused by the loss all mature product was devastating and by 1912, rumors of insolvency were rampant. The company was forced into receivership at the end of the year and, on the night of foreclosure of Pioneer Farms, John G. died at age 46. The distillery buildings were preserved as a museum but in 1962, a fire in the boiler house reduced it to ruins.